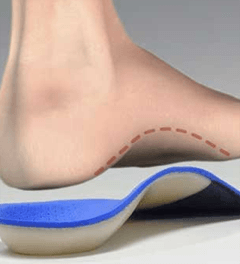 Orthotics, also known as orthoses, are any number of specially designed devices inserted into shoes to provide relief from a wide range of foot-related ailments and injuries. Orthotics can help alleviate pain, assist movement, control abnormal motion, reduce pressure, alter function, aid in rehabilitation, help correct shape and posture, and provide support. Here’s just a partial list of conditions that may benefit from properly fitting orthotics: arthritis, inflamed calluses, bunions, heel pain, shock absorbency, abnormal walking patterns (especially in children), tendonitis, and overuse syndromes. Diabetic patients who require protection against open sores can also benefit from these foot aids. Orthotics are not only helpful to those with foot problems, but orthotics can also benefit athletes, by providing added cushion, protection and lift, and have become a popular and essential component of Sports Medicine. Whether or not you would benefit from orthotics is dependent upon the condition you have. 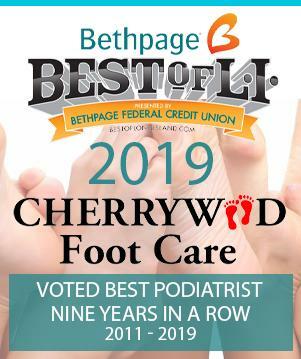 At Cherrywood Foot Care, we make that determination on a patient-by-patient basis following a comprehensive assessment examination that takes into consideration a patient’s symptoms, activities, hobbies and lifestyle. If orthotics are recommended, they will be custom fabricated specifically for your feet. Customized orthotics have no substitutes. Specially molded to the precise biomechanical measurements of your feet in order to address the concerns which affect you the most, they are the best solutions to achieve expeditious, long-lasting relief. Over-the-counter, mail-order and orthotics purchasable over the Internet, while at times perhaps easier on the wallet, are in fact harder on your feet in the long run. They are not made to an exact model of your feet and therefore will not properly fit an individual’s unique foot structure. They also have a short longevity, and must be replaced more often. We advise against them. As mentioned, properly fitting custom orthotics also hold substantial benefits for professional and recreational athletes. Just as orthotics can help alleviate pain, distribute weight and control motion among those with certain foot conditions, so too can they benefit those who are constantly up on their feet and on the go, whether those activities be jogging, sprinting, or a variety of other exercises. Orthotics have consequently become an significant and ever-growing element of Sports Medicine. The field of sports medicine encompasses a wide range of sports- and exercise-related ailments and conditions, from physical fitness to the treatment and prevention of injuries. Once a duty relegated primarily to physicians tending to the physical well-being of players on specific sports teams or franchises, sports medicine is now a sought-after specialty comprising a patient base as diverse as the exercising “weekend warrior” all the way up to and including the professional sports player. At Cherrywood Foot Care, we pride ourselves on being the go-to center for all of your sports- and exercise-related needs, whether that be a sprained ankle from a challenging game of tennis or an Achilles tendon tear from a vigorous run. Whatever the sport, whatever the injury, Cherrywood’s team of experts can help. It doesn’t matter if you are a professional athlete or play sports just for fun, the demands made on your feet and lower limbs are the same, and can lead to a range of injuries, including blisters, sprained ankles, torn ligaments, shin splints, knee pain, lower back pain and other joint or muscle problems. Of course, added to this list are common complaints, such as corns, calluses and Athlete’s Foot. Your running style, quality of footwear, and even minor limb length differences can contribute to injury. At Cherrywood Foot Care, we have all the solutions you need to not only continue in your sports- and exercise-related pursuits, but quite simply, to excel, in healthy and fulfilling fashion. Wear only good-quality, well-fitting cotton socks. This will help absorb excess moisture on your feet and in between your toes, helping to prevent Athlete’s foot and other feet-related fungi. Wear the correct shoes. The proper footwear is just as important as any other piece of sporting equipment and should be considered as much. Sports shoes should protect as much as possible, be durable, and should be the right match for the sport and surface. Get in shape. Being overweight or out of shape places added stress on your feet. Condition yourself gradually with stretching exercises for 15 to 20 minutes (warm-up and cool-down periods) before and after any activity. Know your capabilities and your limitations. Don’t over-exert yourself. Doing so can lead to injury. Stay hydrated. This will ensure your body does not become dehydrated, which will help prevent unnecessary pain and injuries to your muscles and tendons. Doing so will consequently also help prevent other injuries. At Cherrywood Foot Care, we stand behind our orthotics. So will you.